It took a lot of work and our parents were amazing, it was a lot of fun and a great success. Our graduate is incredibly appreciative of both the party and the generosity of our guests. The cooking went as expected without a hitch and I had plenty of food. 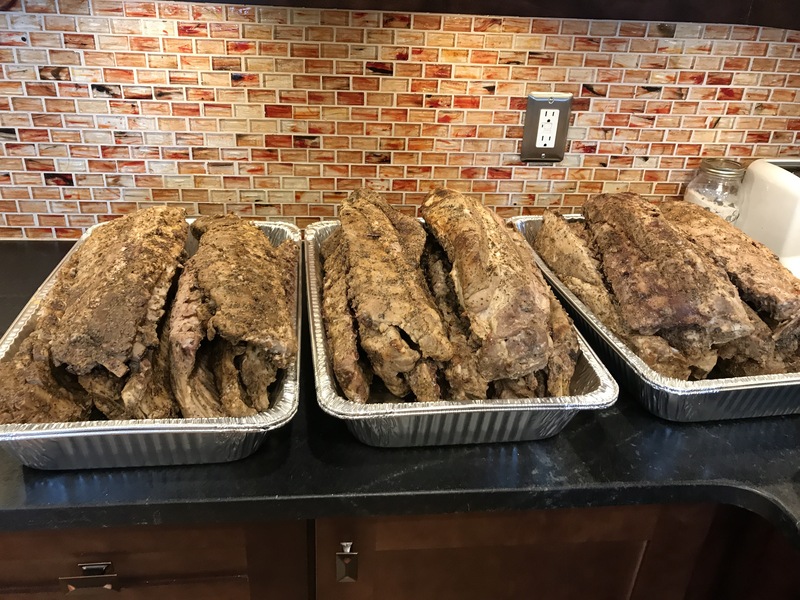 I would probably make a recommendation for those considering ribs for a large party to think about the type of ribs they have when calculating how many to make. 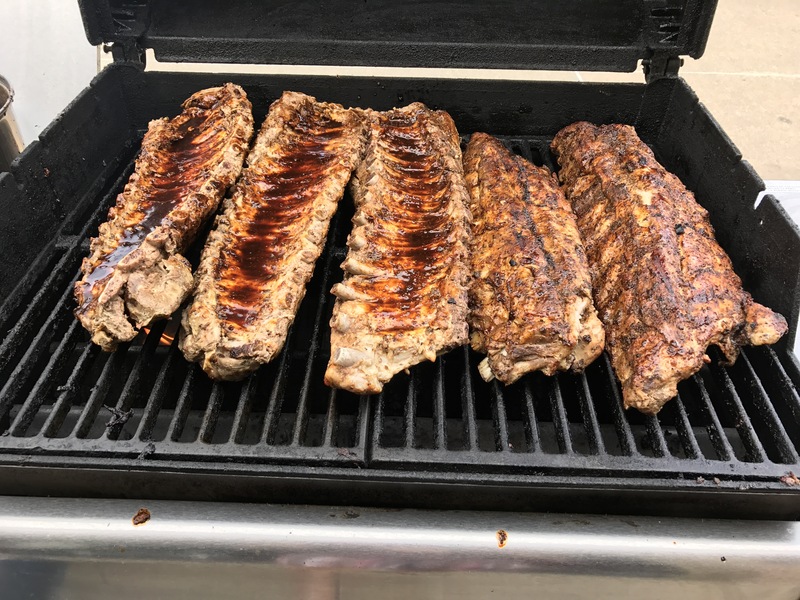 All of my reading lead me to account for 3 ribs per person when serving other proteins. 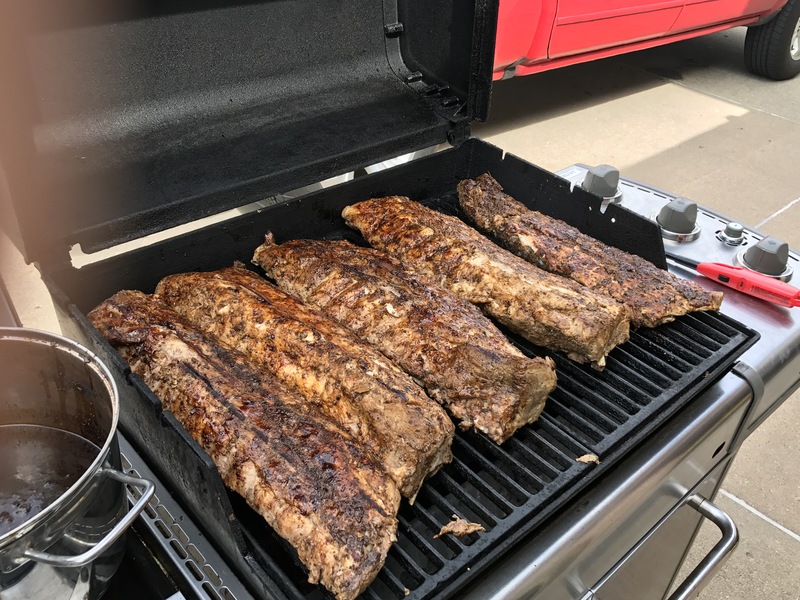 A typical baby back rib weighs 1½-2½ lbs., the ones I had were 3½-4½ lbs, I would have come closer to what I needed if I had done my calculation with the thought of 2½ ribs per person. 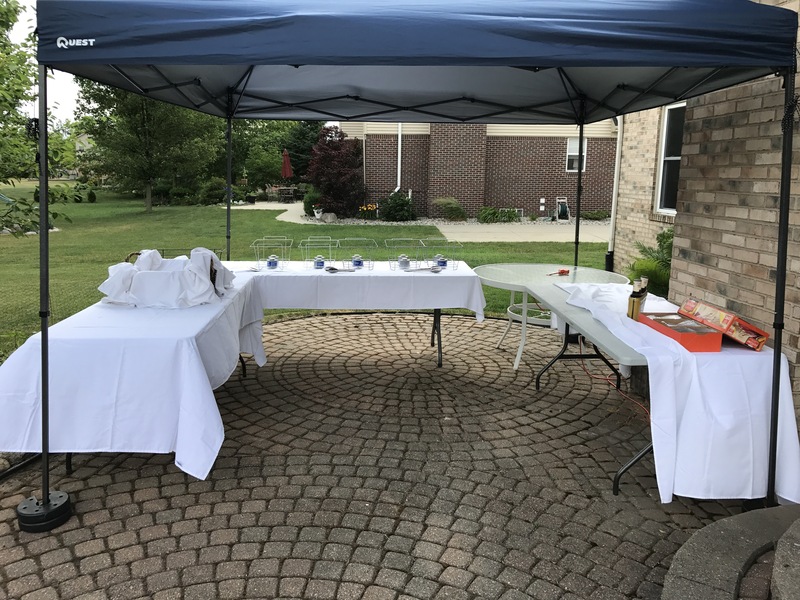 On the day of the party, I started by getting the ribs and mac and cheese out so that they could come to room temperature for more even cooking. Everyone in the house chipped in; this included both boys, my mom, and my in-laws. Once everything was set, excluding the food, I sent my team on missions, boys to get the fried chicken, moms to get the cake, and men to get the beer. 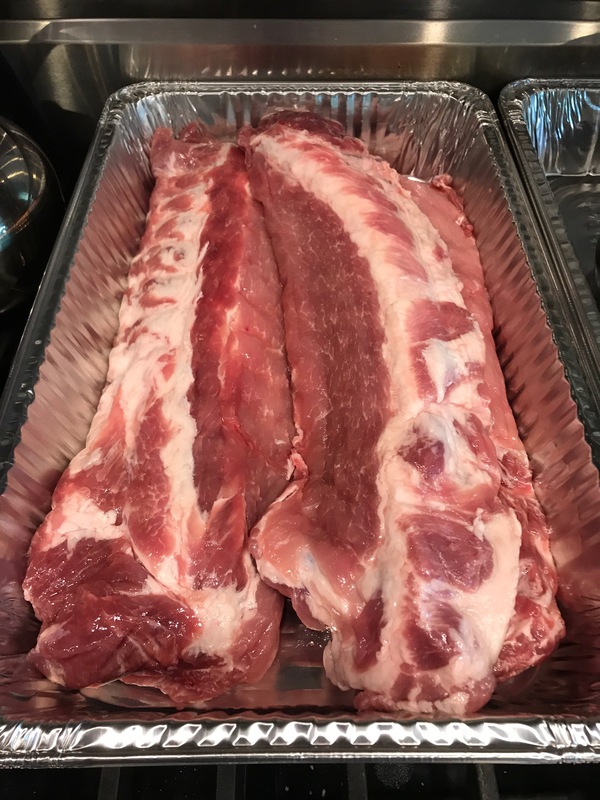 I set about to cooking and put the mac and cheese in the oven and started on the ribs. 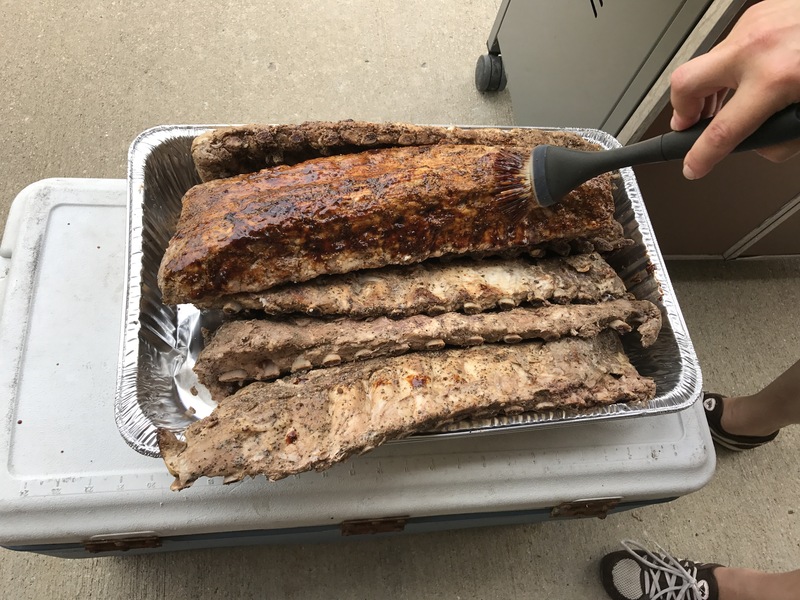 I took each pan of ribs out to my grill, and brushed one side with my glaze, and once they were on the grill I glazed the other side. 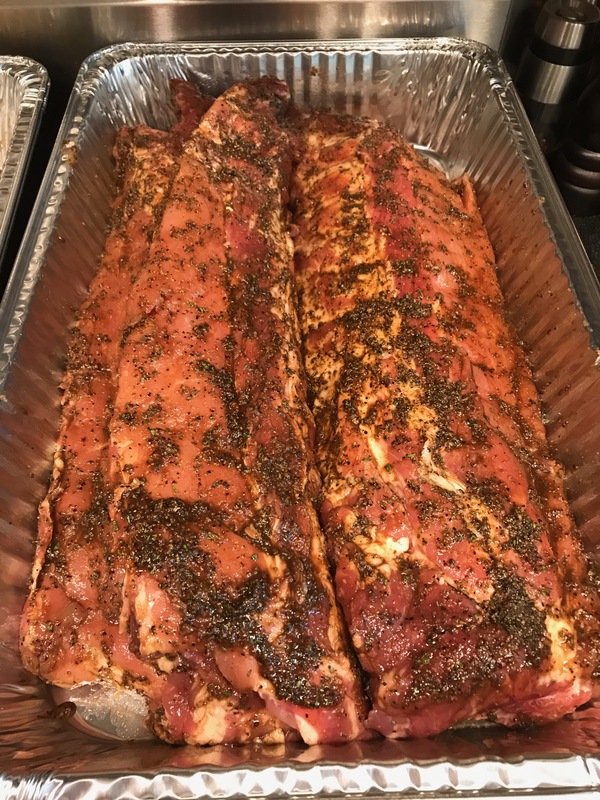 I moved them through from one side of the grill to the other and ultimately transferred them to a cutting rack for my dad to cut them into single and double ribs and put them in the trays covered with foil to stay warm. Just before the party we set everything out and started the slide show. The recipes are as follows and can obviously be scaled as needed. I hope that you enjoy! Please ask questions if you have any regarding the recipes. 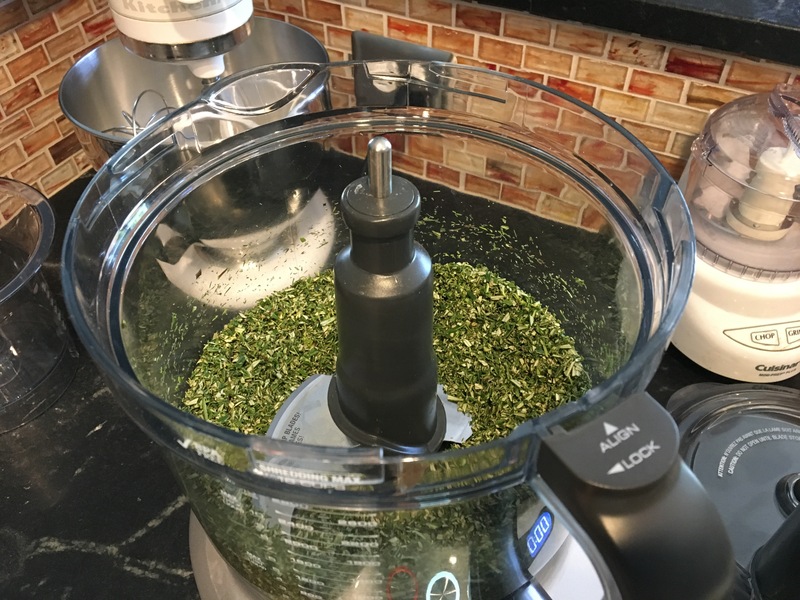 Salads, Summer, Tested and Approved! 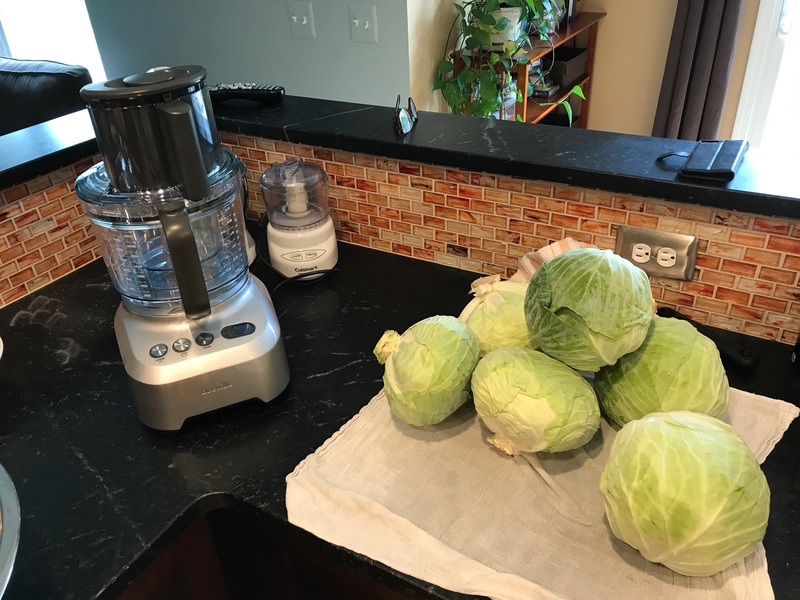 Shred cabbage. 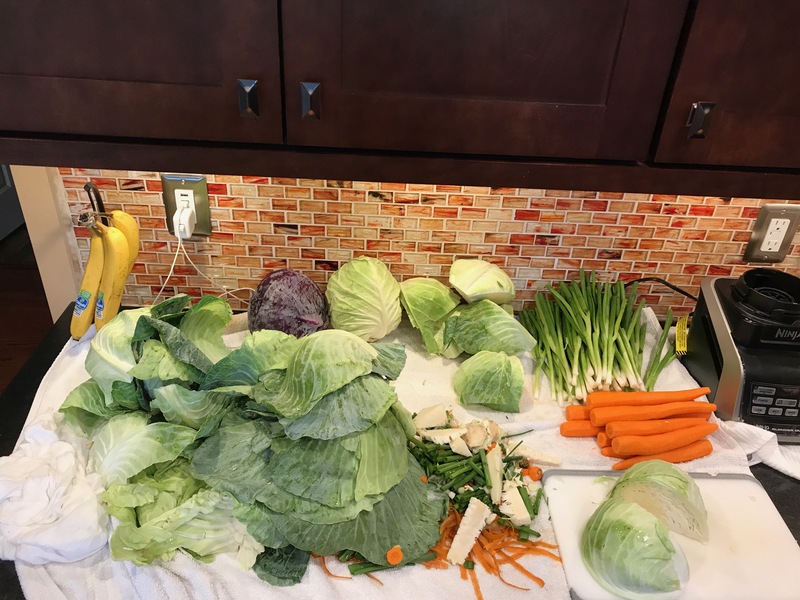 Mix remaining ingredients and pour over cabbage. Salt and pepper. 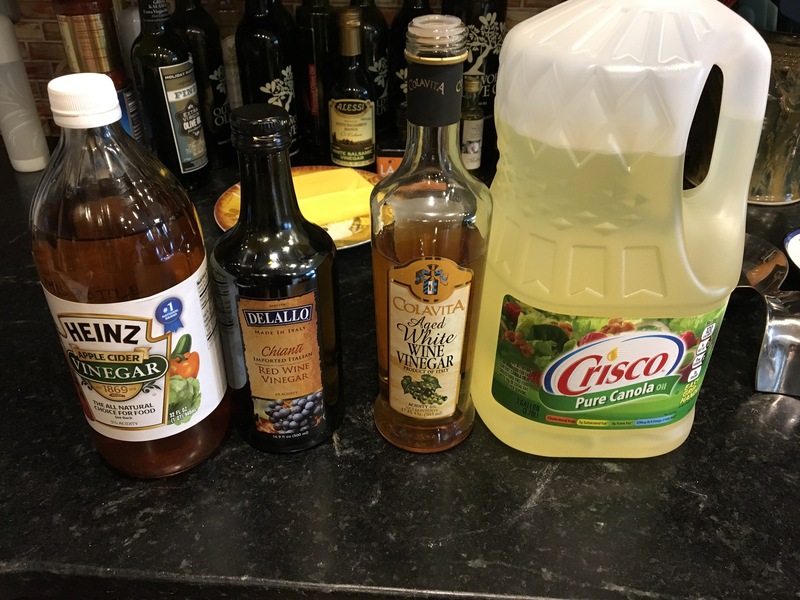 Add red cabbage and carrots, or use other vinegars for altering flavors and adding color. 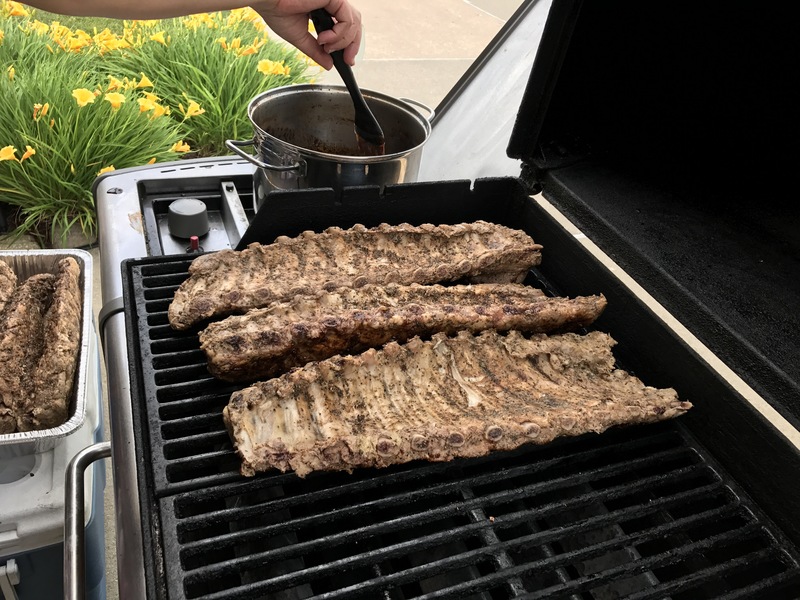 If you can only get larger ribs (4 racks), you will need more glaze; use 12 large garlic cloves, 3 tablespoons finely chopped rosemary, 3 tablespoons packed dark brown sugar, 3 tablespoons balsamic vinegar, 1 1/2 teaspoons cayenne, 1 1/2 tablespoons salt, and 1 1/2 teaspoons pepper. 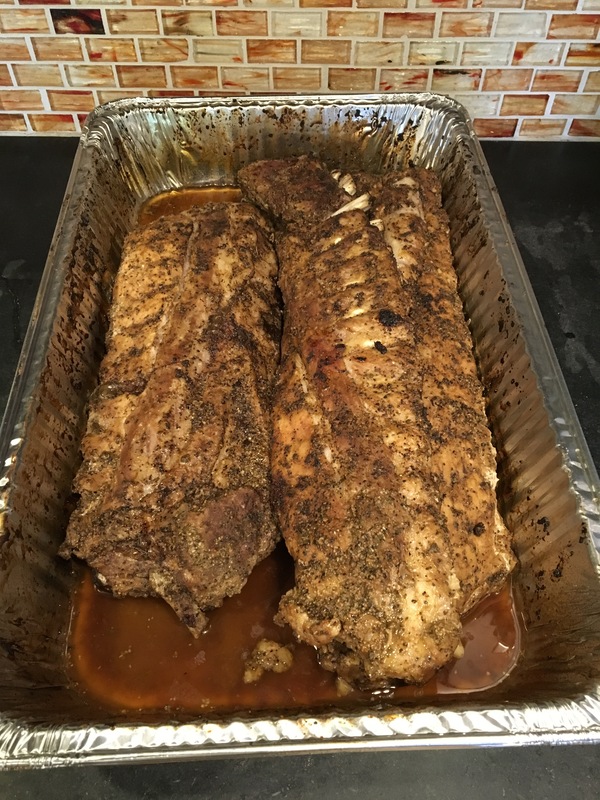 Ribs can be roasted and glaze can be made ahead and chilled separately (covered once cool). Bring to room temperature, about 30 minutes, before glazing and grilling. 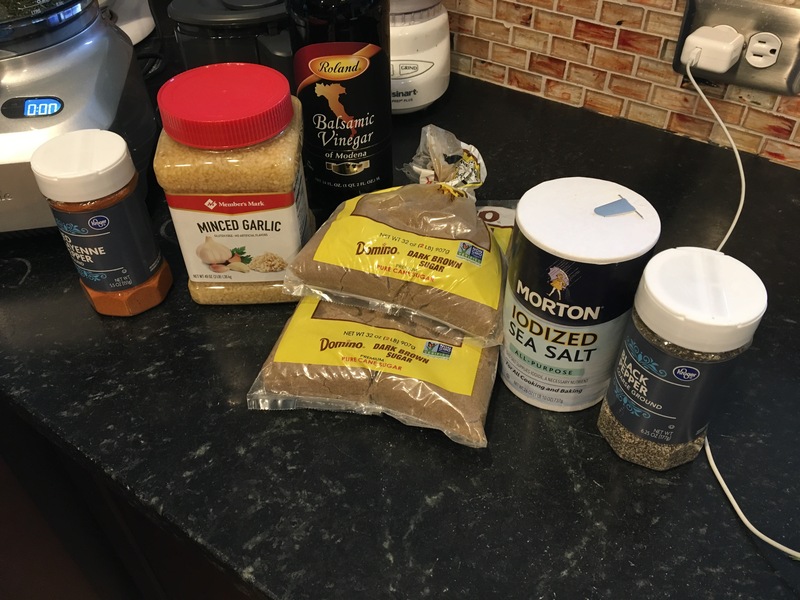 Mix the ingredients in order and salt and pepper to taste. Optionally, top with panko or crushed saltines. 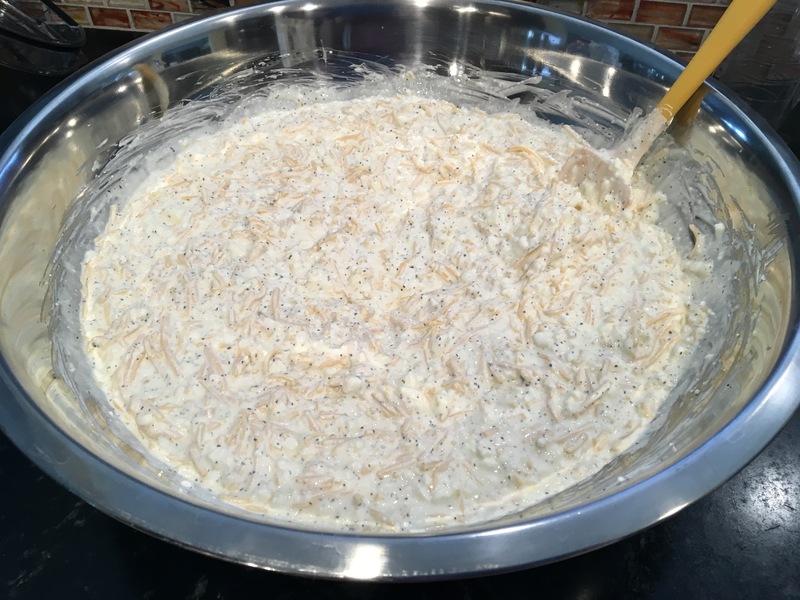 Can be mixed in an oven proof bowl and baked directly or for more crispness on the top, bake in a 9 x 13 pan. Also scales well for large groups. 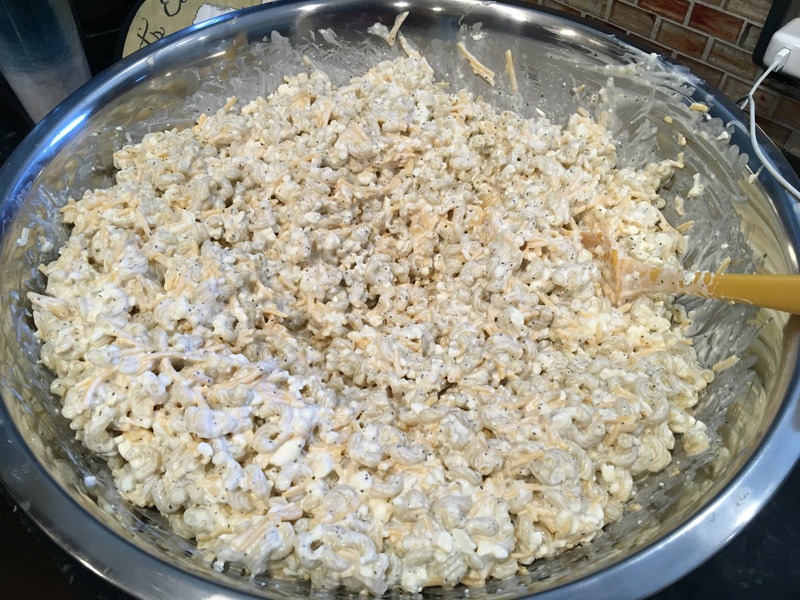 I have played with this recipe successfully including substituting Picolini for the elbows, dropping the cottage cheese down to 16 oz. 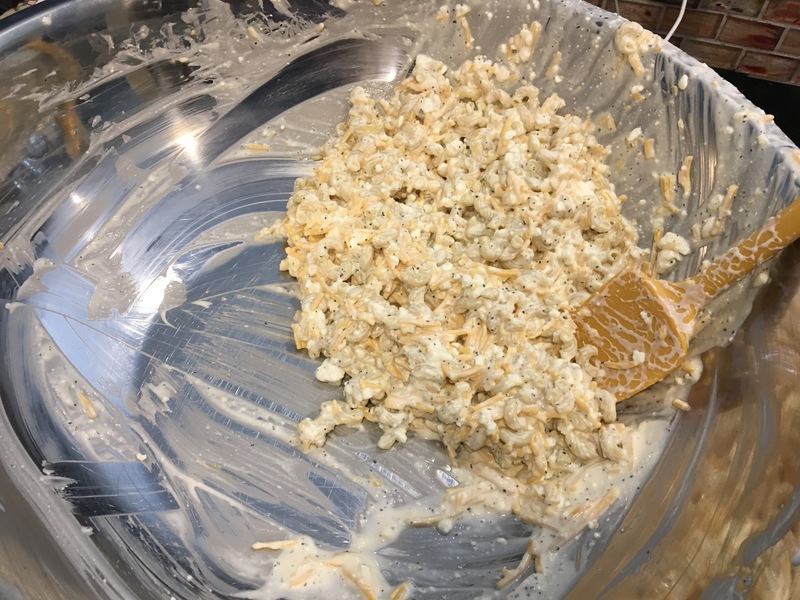 and replacing with feta, and replacing half the cheddar with other cheeses such as smoked Gouda. 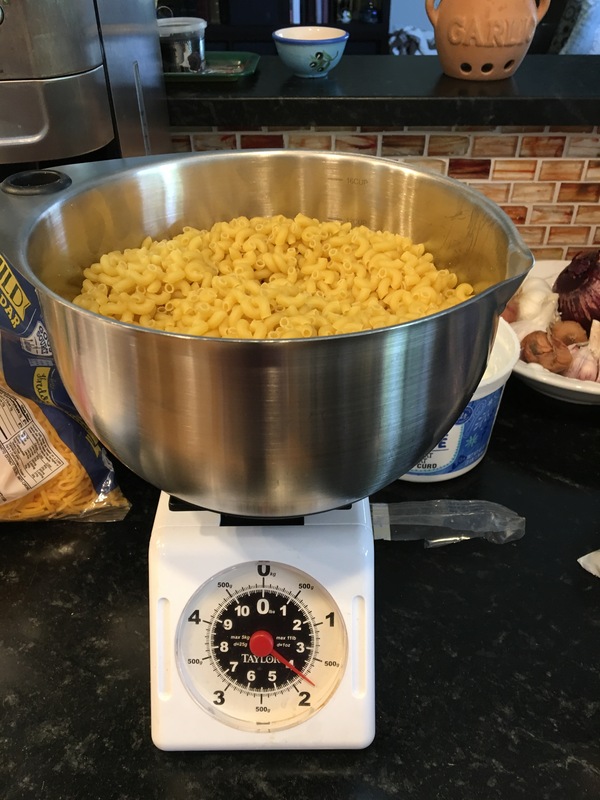 To make this as Bacon Mac & Cheese, use 3 eggs, and reduce cheddar to ~1 cup, and add 1 block of shredded sharp white cheddar, 1 block of shredded Boar’s Head 3-pepper co-jack, and ~1 pound chopped cooked bacon. 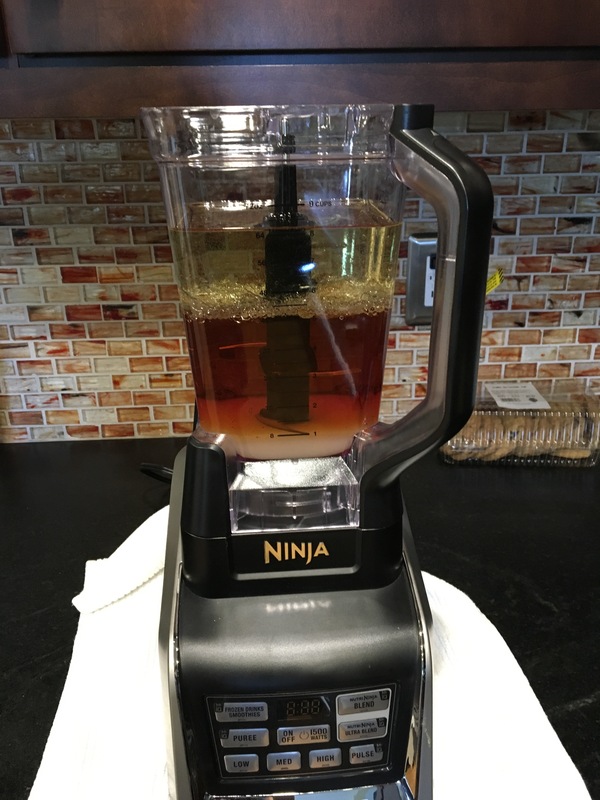 Dissolve yeast in a small amount of warm water. Mix milk, sugar, and salt in a small saucepan and heat to ~105℉. 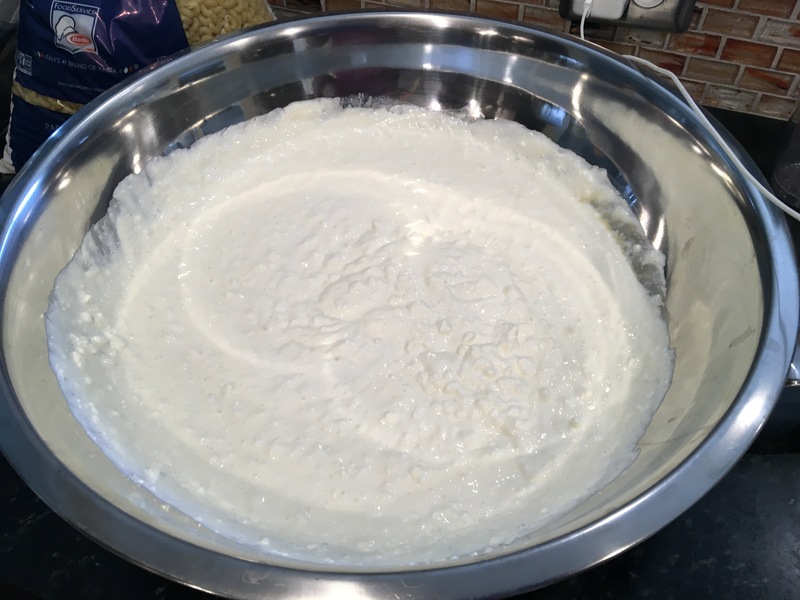 When the milk is warm pour into a large bowl and mix in the yeast. 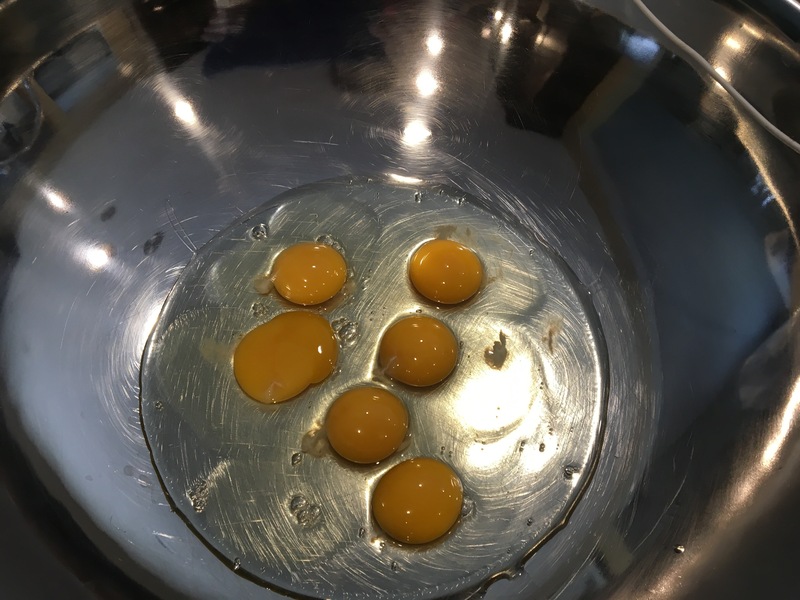 Stir in the eggs and butter. 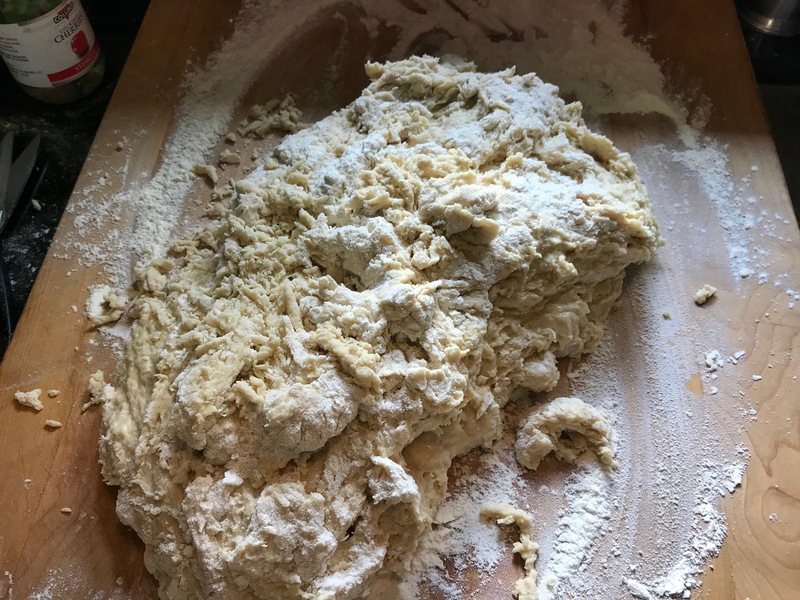 Start mixing in the flour, stirring until thick and then kneading until soft and elastic. 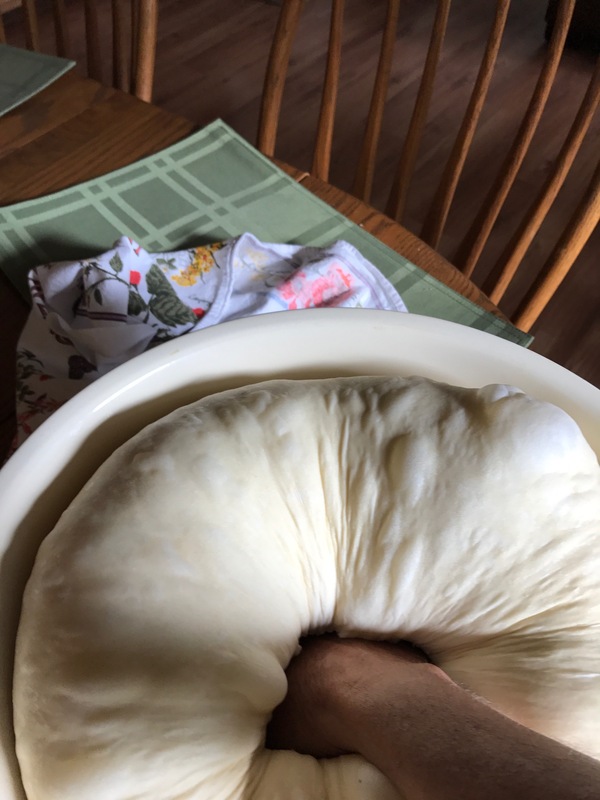 Allow to rise for 2 hours (until doubled) then punch down. 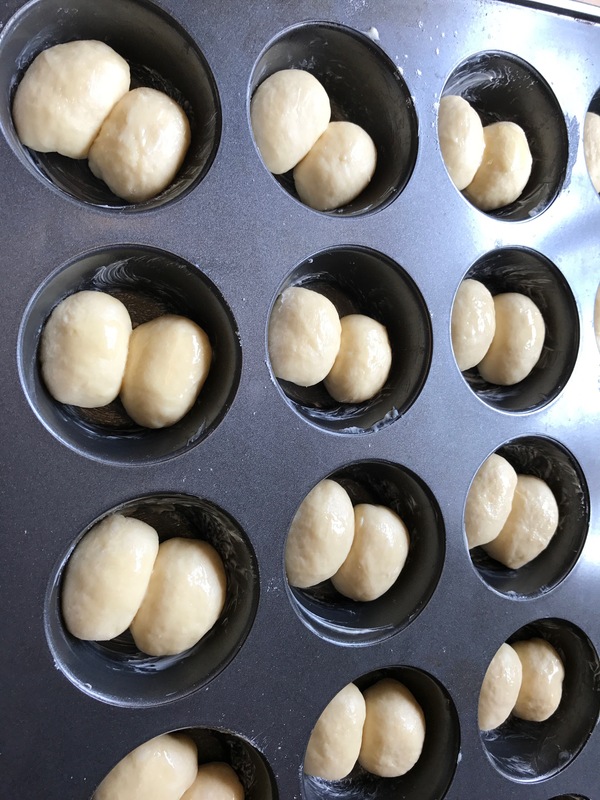 Butter pans (allowing dough to rest) then make the rolls. Allow to rise until light. Bake at 400℉ for 15 minutes. 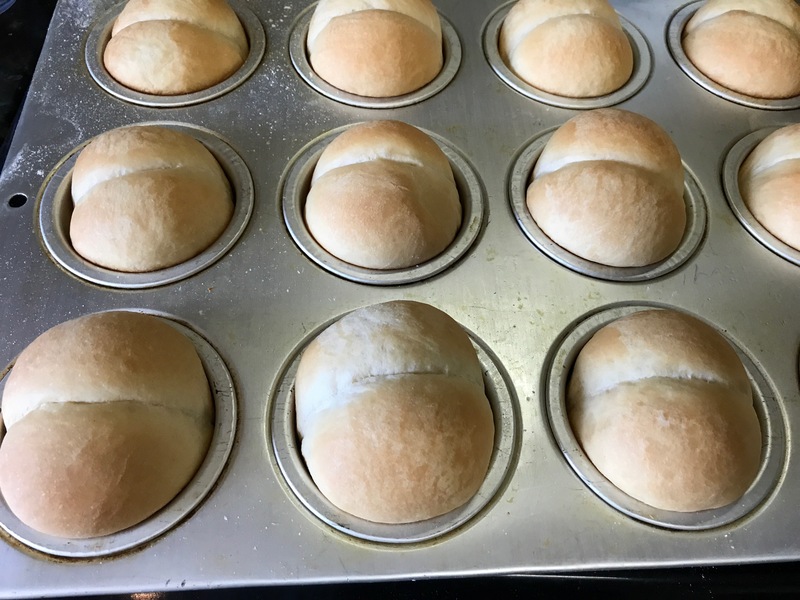 Use light colored metal pans to bake the rolls, dark and glass pans can tend to over bake the bottom. 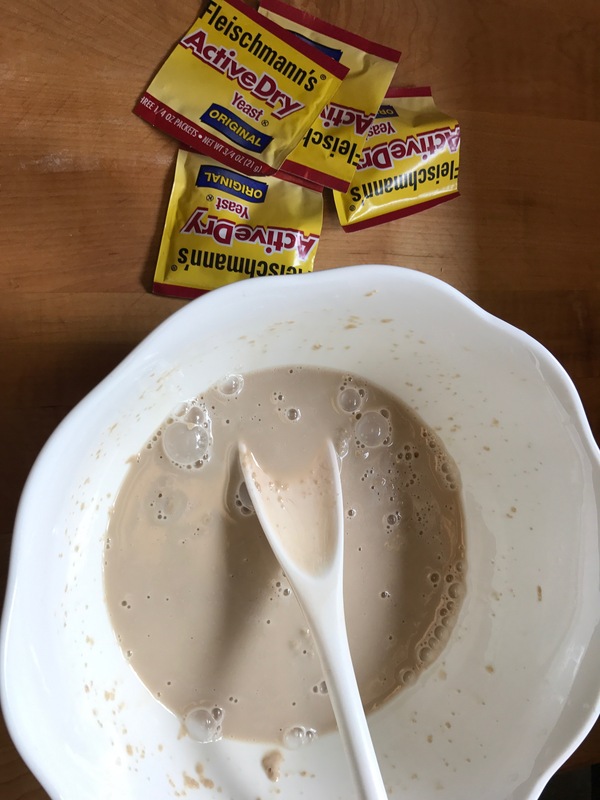 In a large bowl, combine the whole wheat flour, salt, and yeast. 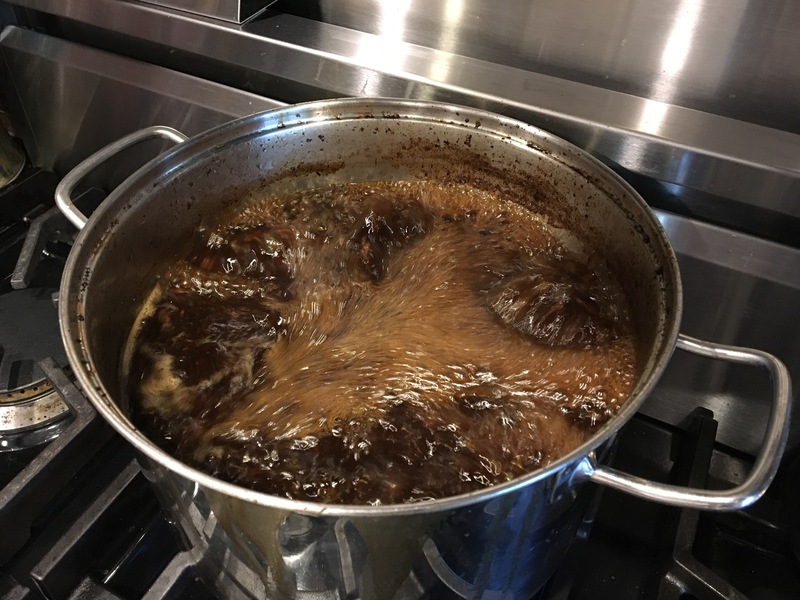 In a pan, heat water, milk, honey, and oil until warm. 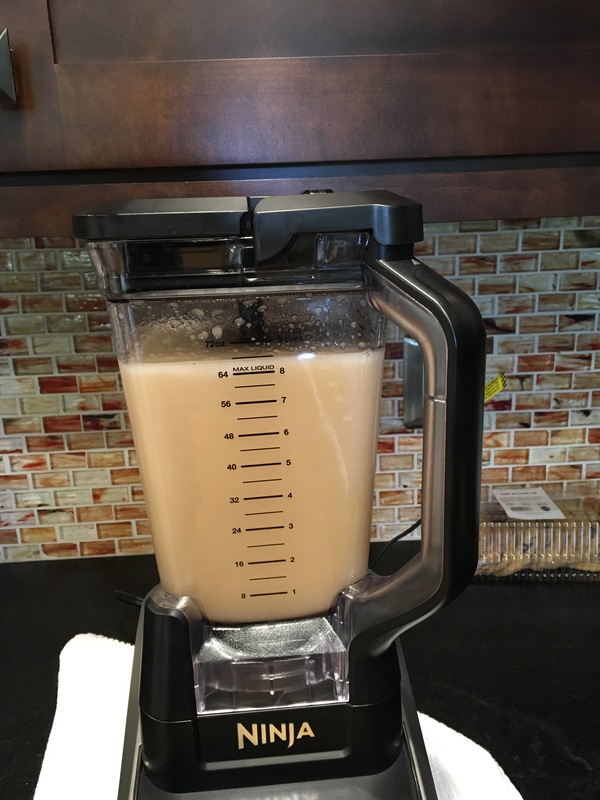 Pour liquid over flour mixture and mix for two minutes with a mixer. 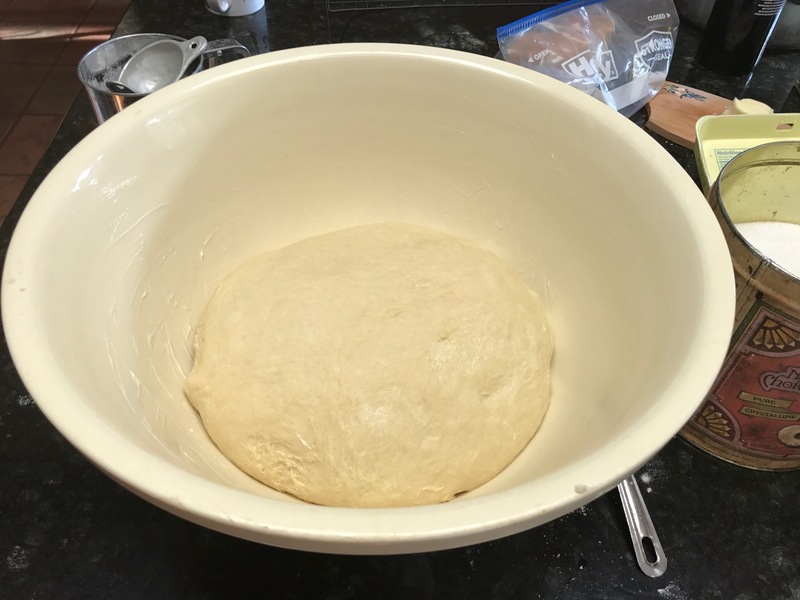 Add white flour until smooth and elastic; knead for 5 minutes. Raise for 60-90 minutes (until doubled). Punch down and shape into loaves. Let raise for 45-60 minutes. Bake 30 minutes at 400℉. 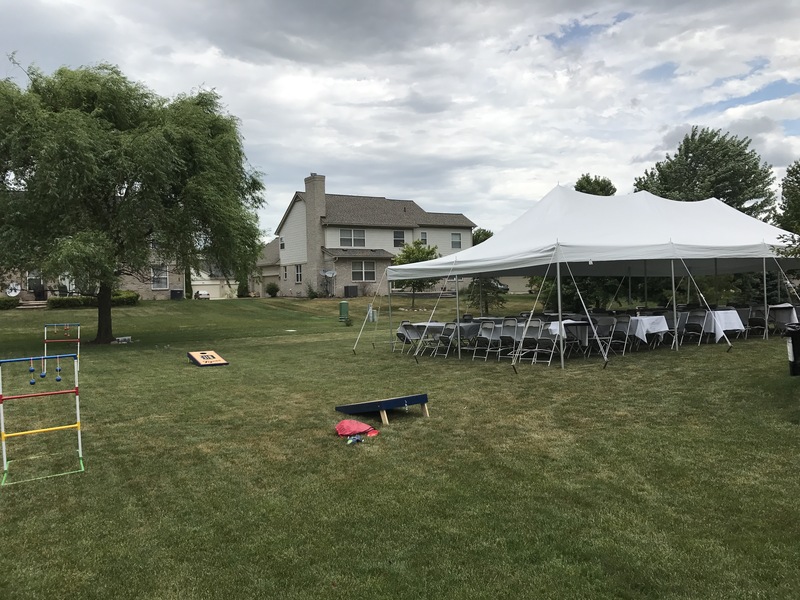 Only 21 hours before the party and I think we are set. I finally made it through 18 years of pictures, I had been delinquent for the past 10. 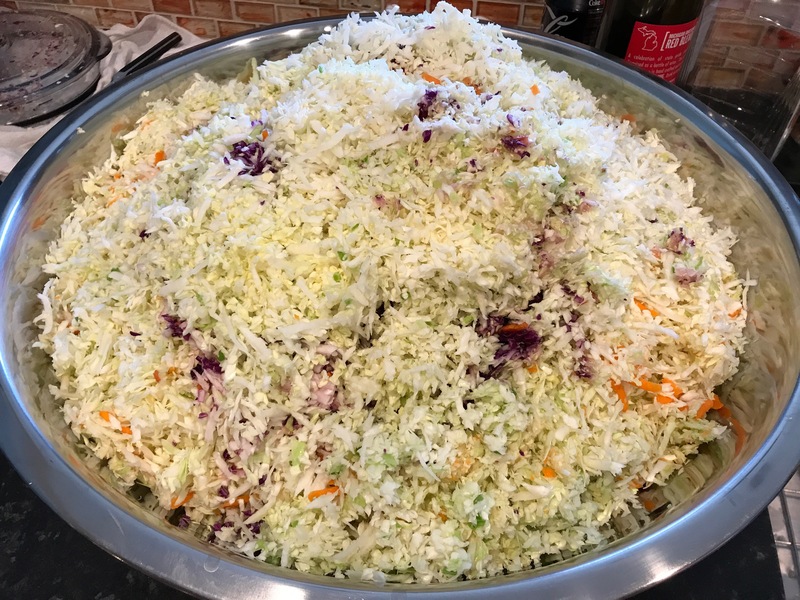 But that’s not why you are reading this, today I finished the cole slaw. 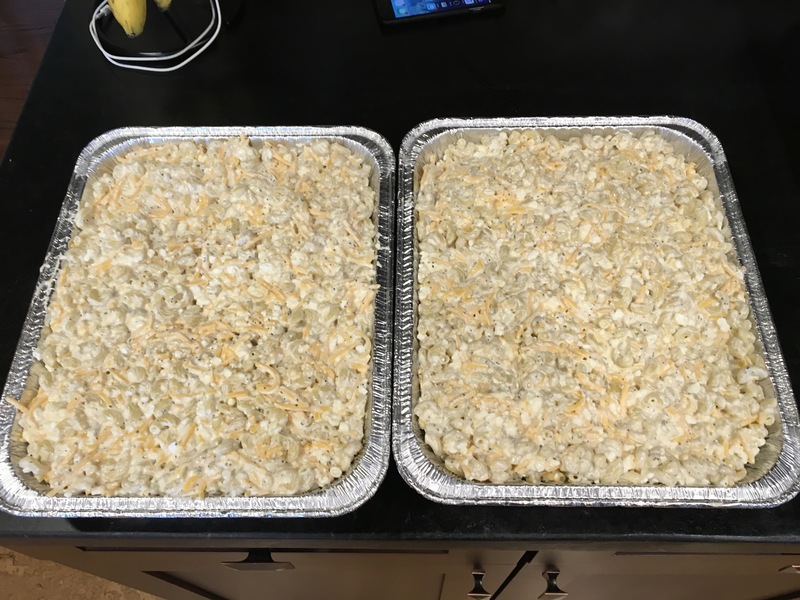 I did two quintuple batches and ended up with 3 full trays. 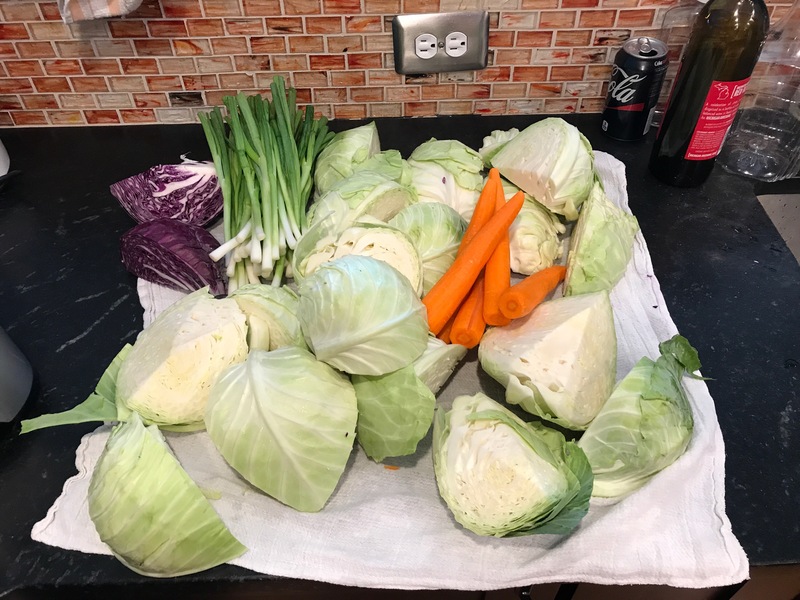 I didn’t want to have the veggies around for long so my mom and I picked those up this morning: 10 heads of cabbage (9 green and 1 red), 10 bunches of green onions, and 2 lbs. of carrots. When we got home we cleaned them all and peeled the carrots. 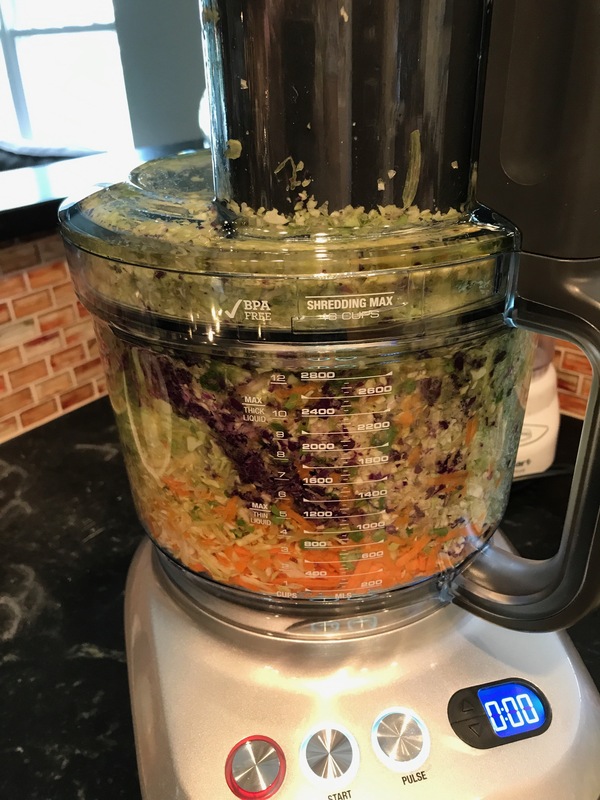 Then we went to work on slicing the green onions and shredding the the cabbage and carrots in the food processor. 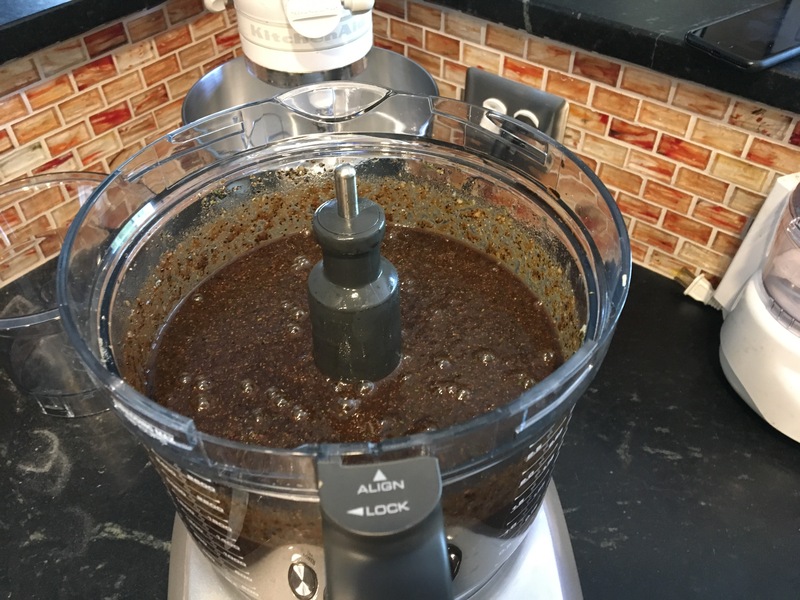 I placed each batch in my large bowl and added half of the dressing I made the other day. As always, I seasoned well with salt and pepper. Stirring was a little bit fun, but I managed to keep it all in the bowl. 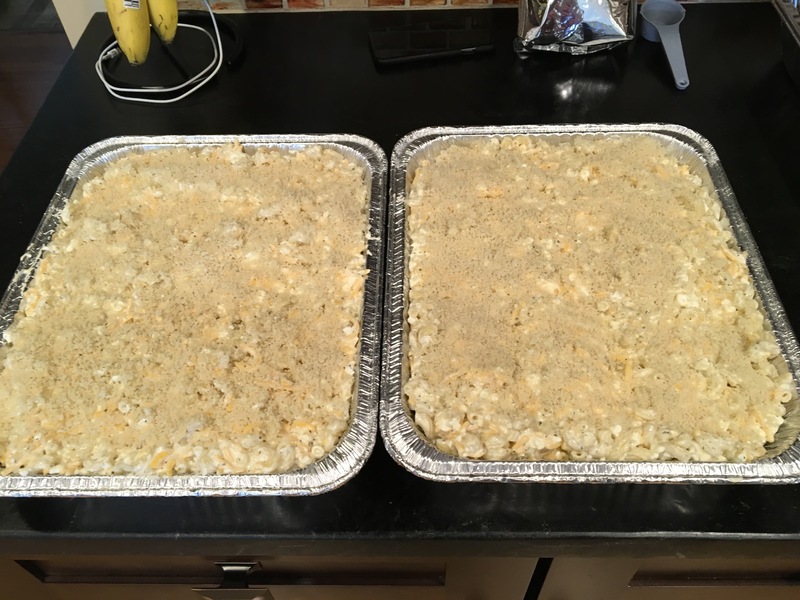 I followed it with the other half of my ingredients and ended up with 3 trays which are now in my MIL’s fridge since I ran out of space. 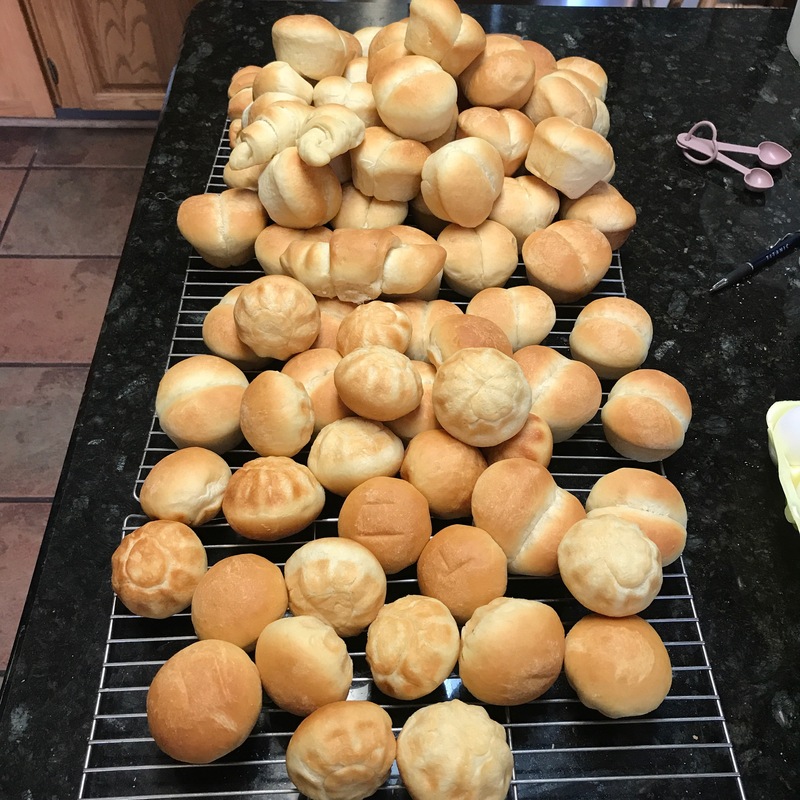 My mother arrived yesterday to assist and also brought home-made rolls, ~17 dozen. She made them in large batches too and while time-consuming, it is simple to make good bread. 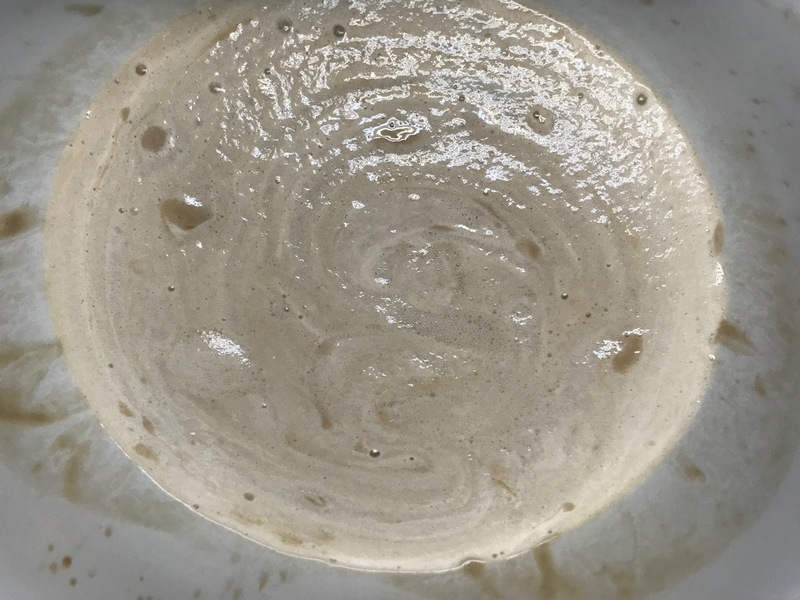 The start is active-dry yeast, proofed with a bit of sugar and warm water until it’s frothy. 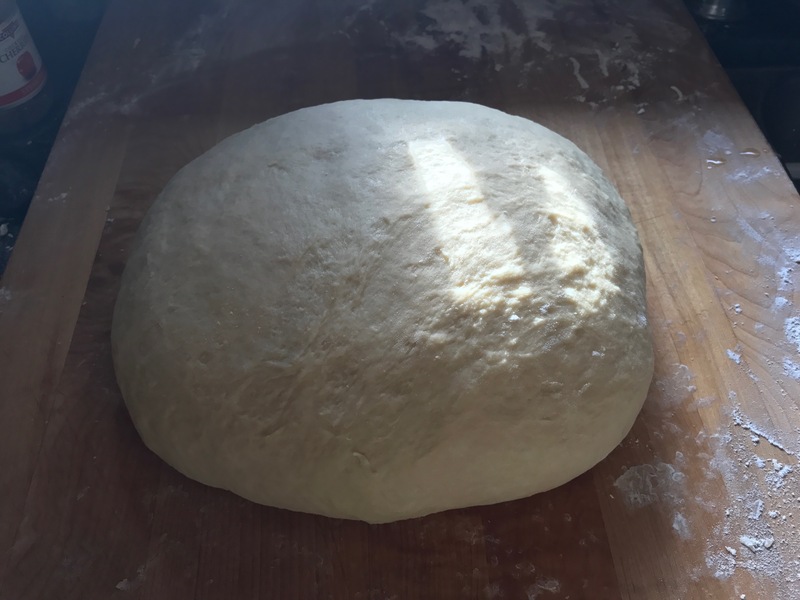 This gets stirred into flour to make a sticky dough, then kneaded with even more flour until smooth. 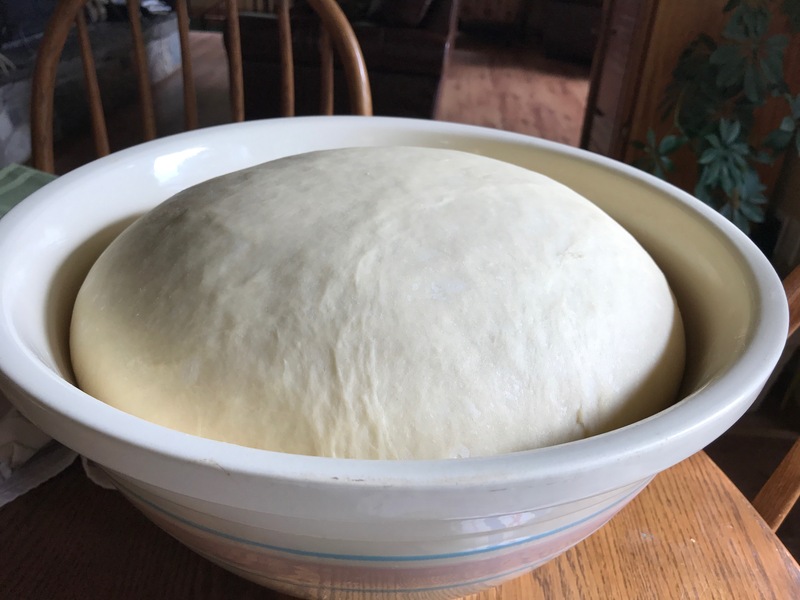 Then you let it rest to rise for about 1½ hours (still using the same bowl that she used when I was a little girl). 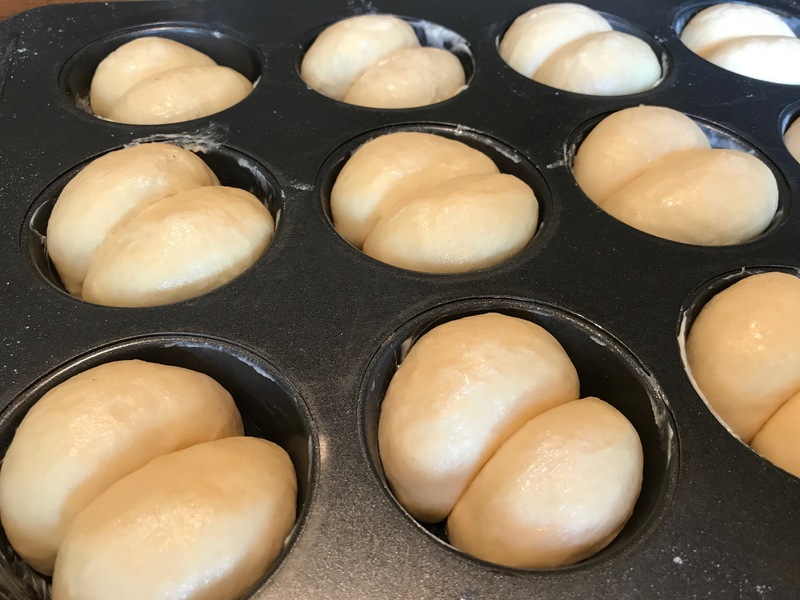 After it’s risen you punch it down, let it rest briefly, shape it into rolls, and then let them rise again before baking them. I’m so excited to enjoy one of these with a bit of butter. I also have signs made, soda chilling, and they put up the tent today. I’ll have one more post tomorrow on the outcome, let’s hope the storms miss us! 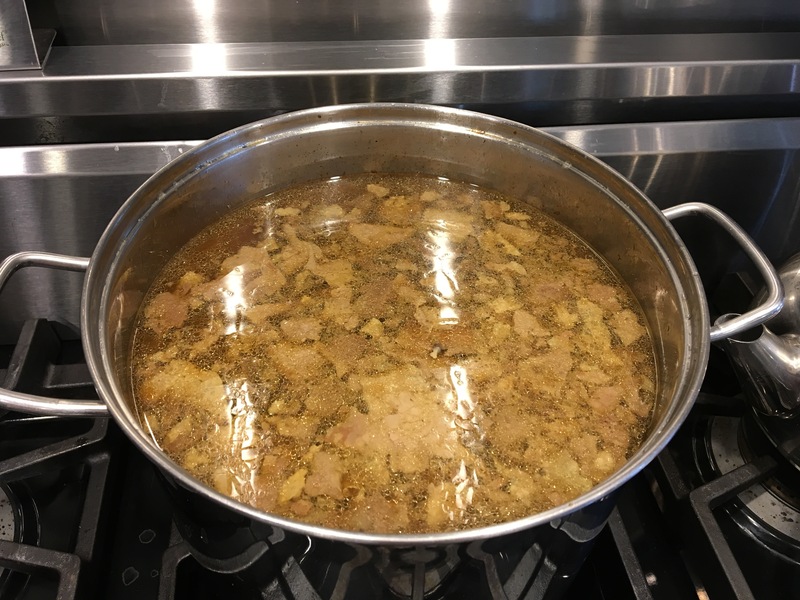 Today I made the glaze for the ribs after removing the last of the fat from my collected drippings. 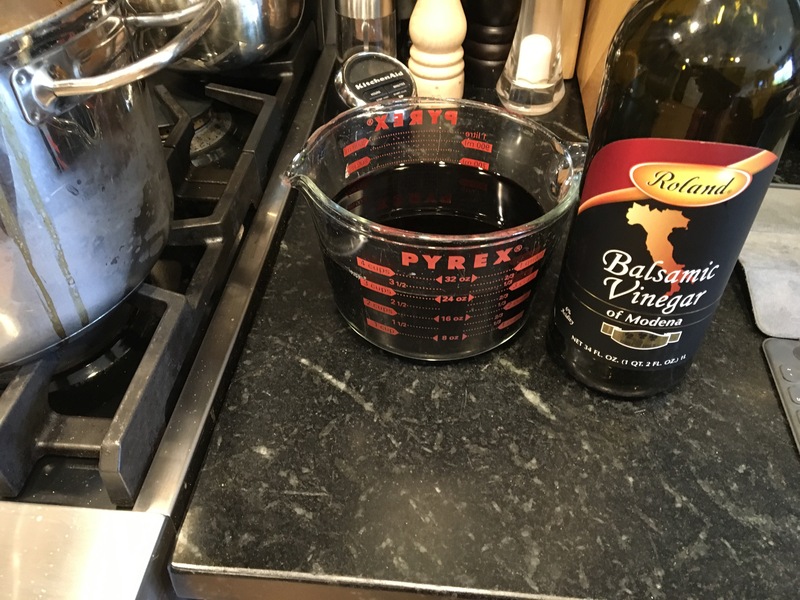 To my concentrated drippings I added the rest of my cheap balsamic vinegar (yes, cheap, only suitable as a marinade and for concentrating). 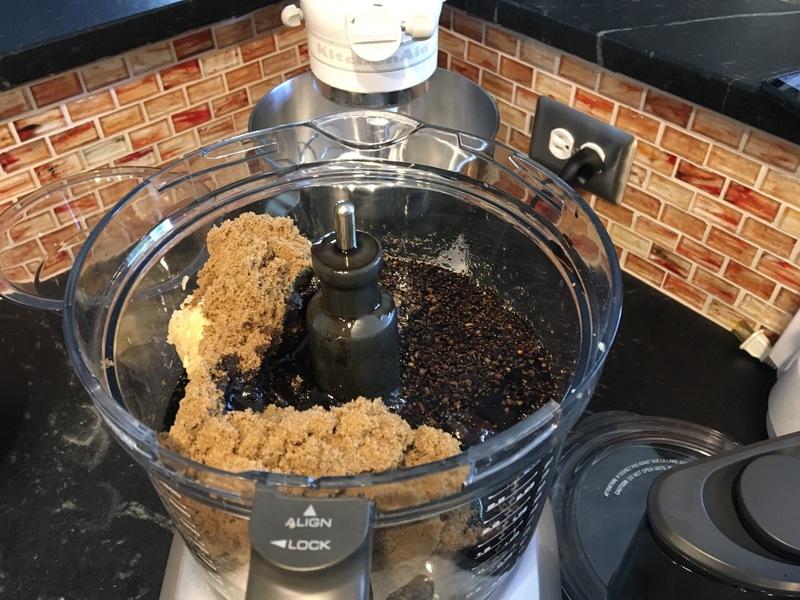 And an equal part of water with 2 cups of dark brown sugar and proceeded to further concentrate the glaze. After a couple of hours I had a thick vinegary sauce. 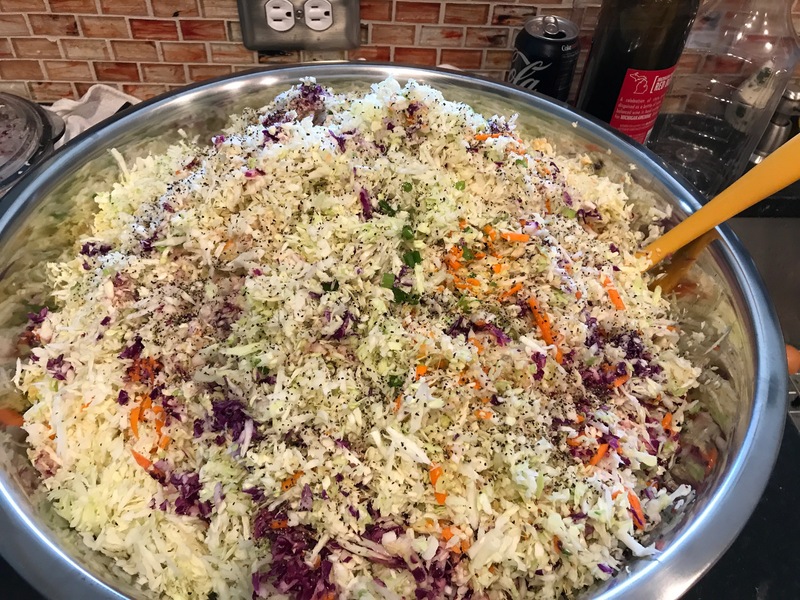 I also whipped up the dressing for my cole slaw that I’m planning to make on Saturday morning, since it is always better if you make it a day in advance. 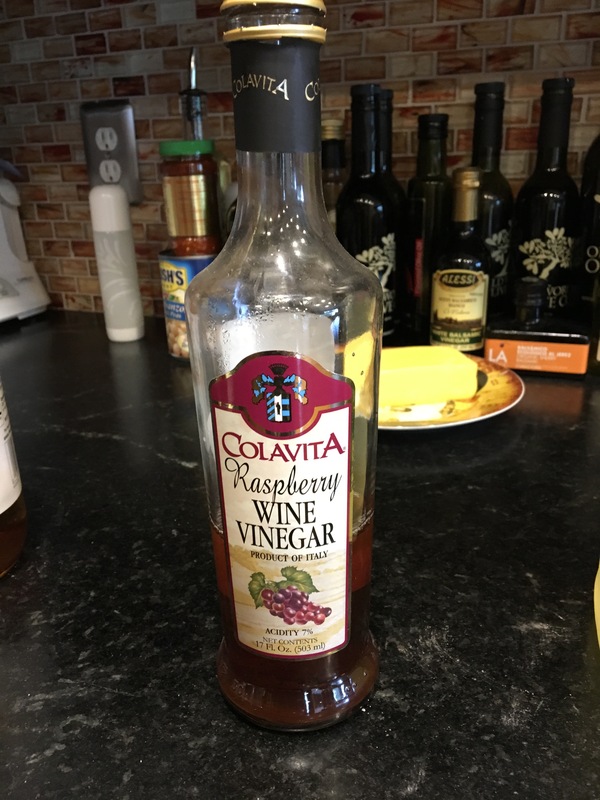 The dressing is very simple; I prefer a vinegar base to a creamy sauce. 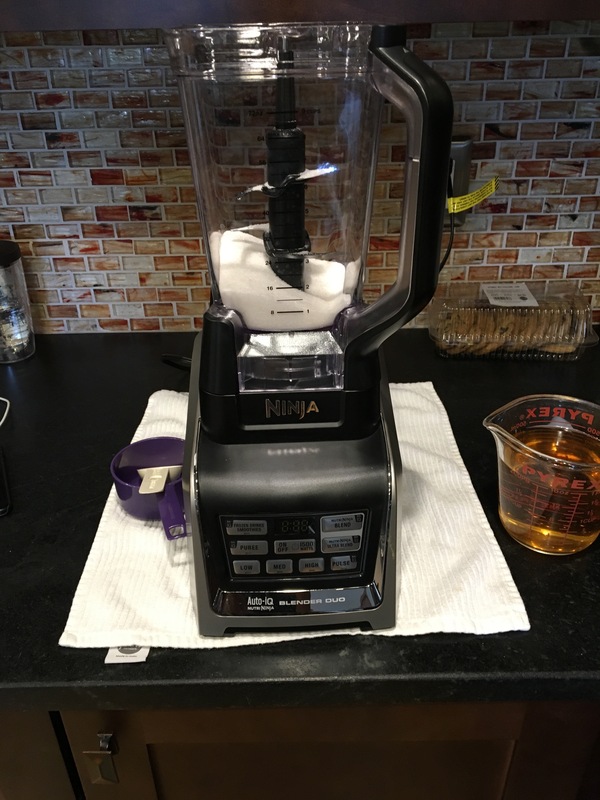 Sugar, vinegars (white wine, red wine, apple cider, and raspberry because I ran out of the red), and oil go into the blender. 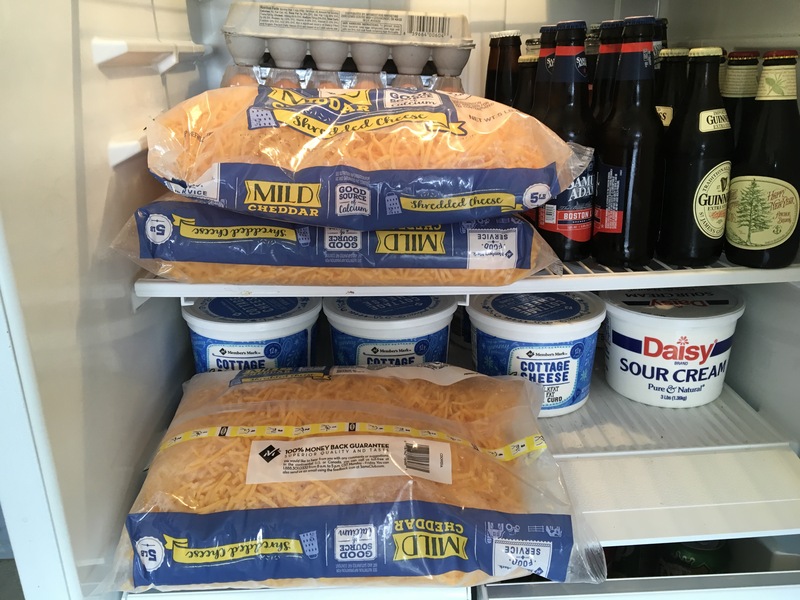 This will keep in the fridge easily. We’ve also been trying to minimize other food in the fridge, so have been keeping dinners simple this week: M-pizza, T-brats, W-sushi, and my hubby suggested cold cuts for dinner and my grad has friends over so I whipped up my version of Italian subs. 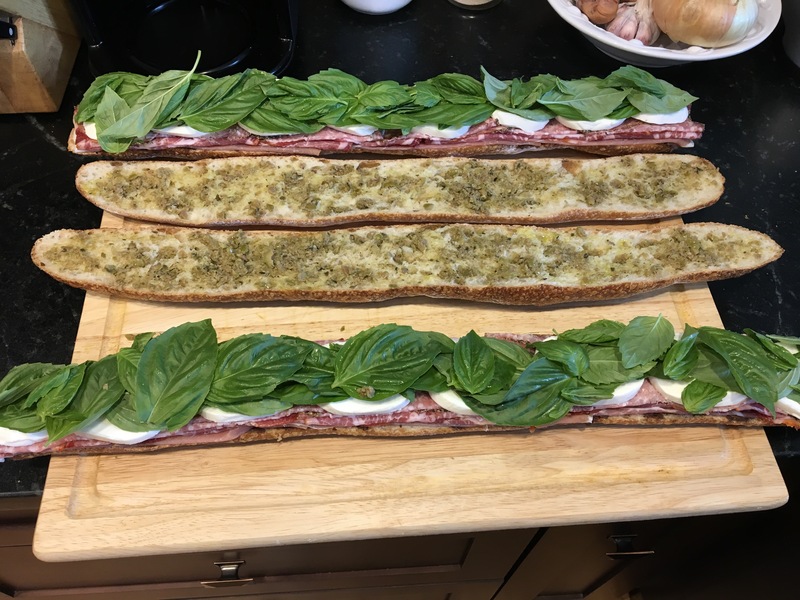 It is fresh baguette, olive oil, olive tapenade, Prosciutto, hot capicola, peppered salami, fresh mozzarella, and basil. Between yesterday and today I have finished up the ribs. 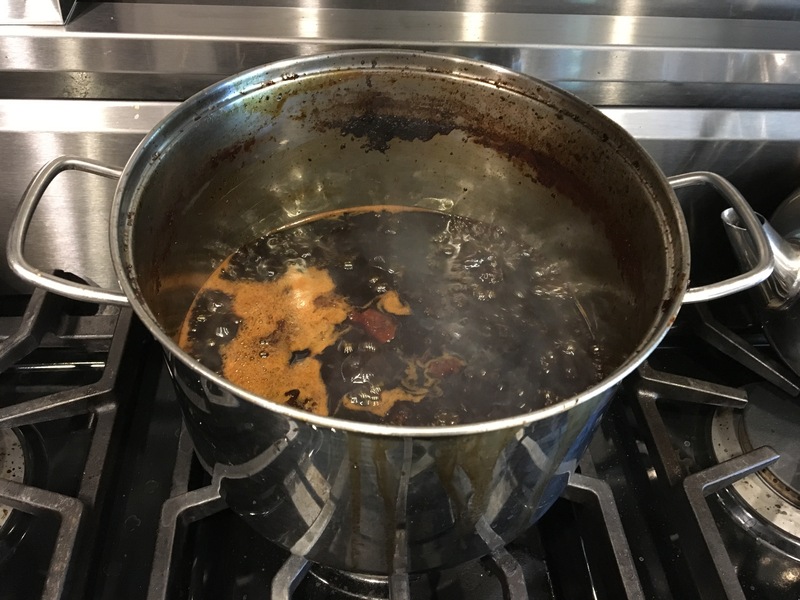 After each batch has cooked, I have collected the drippings in my stock pot. 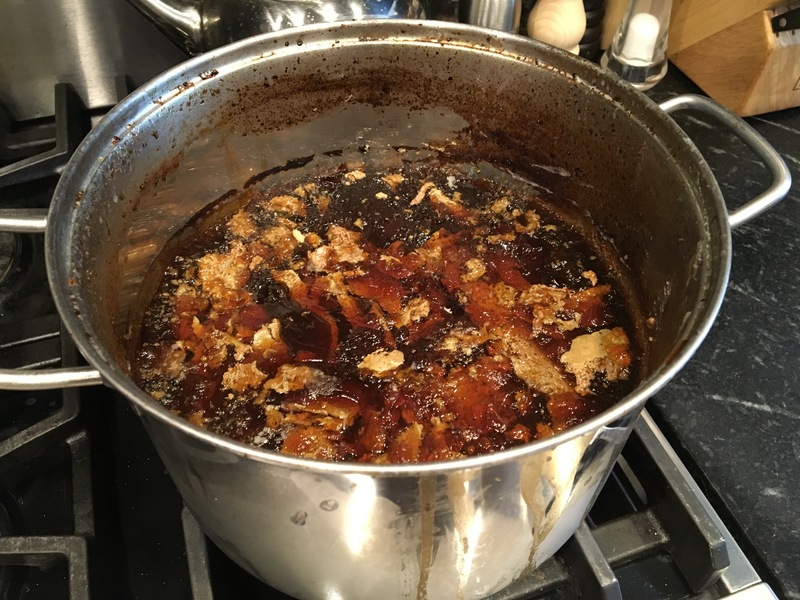 Tomorrow I’ll be making the glaze with it, but in the meantime I’ve been reducing it so that it all fits in the stock pot. I’ve also been skimming off the fat from the top, which is easiest to do after it’s been chilling in the fridge. This image is just after my final addition. With that done, I’m onto the mac and cheese. I’m made this before with the mention that it scales well. 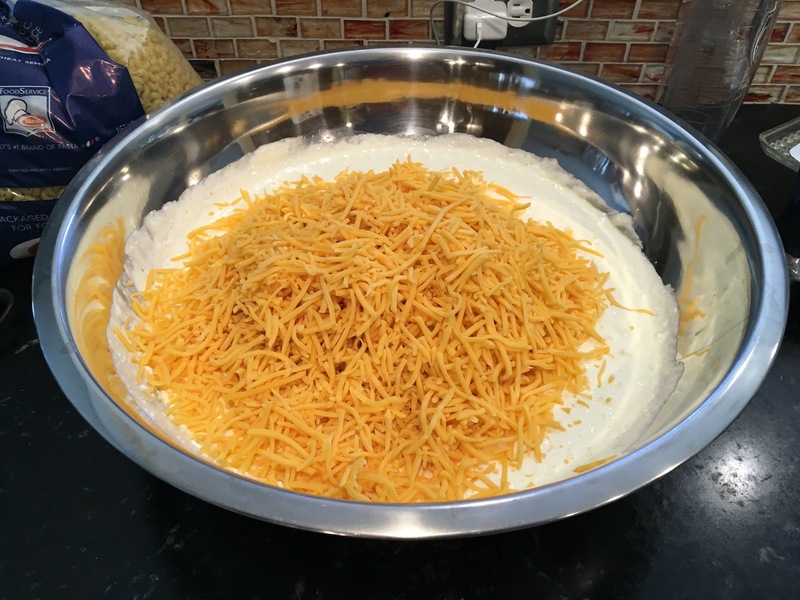 I’ll be making four triple batches for this party and it’s quite the pile of ingredients (just ignore the beer). 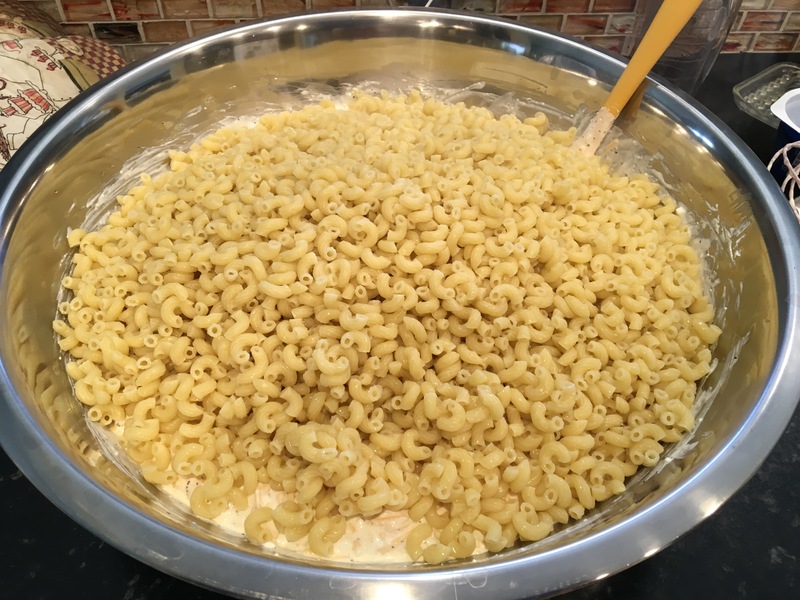 My first task was to spray my pans; a loss of mac and cheese to the side of a pans is tragic! 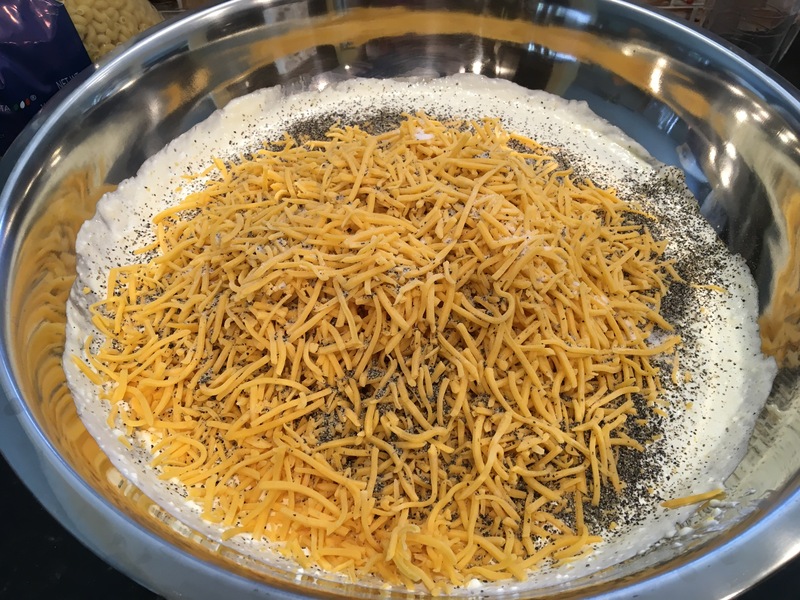 After that on to mixing the eggs, cheeses, and sour cream with a healthy dose of salt and pepper. 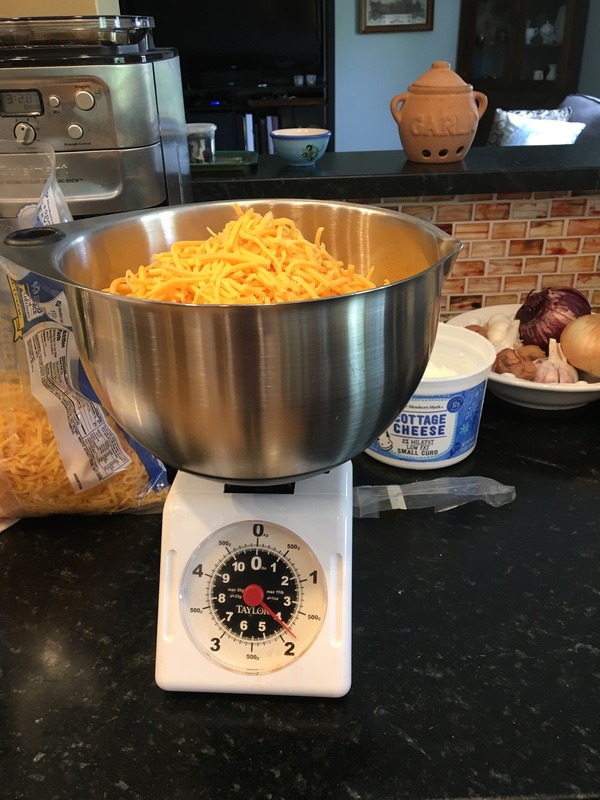 I used my scale to weigh the pasta and cheddar that I purchased in bulk (with the tare set at 1 lb.). I rinsed the pasta with cold water before stirring it in, since these are going in the fridge rather than the oven. And then I topped each pan with panko and covered them so that they would be all set. 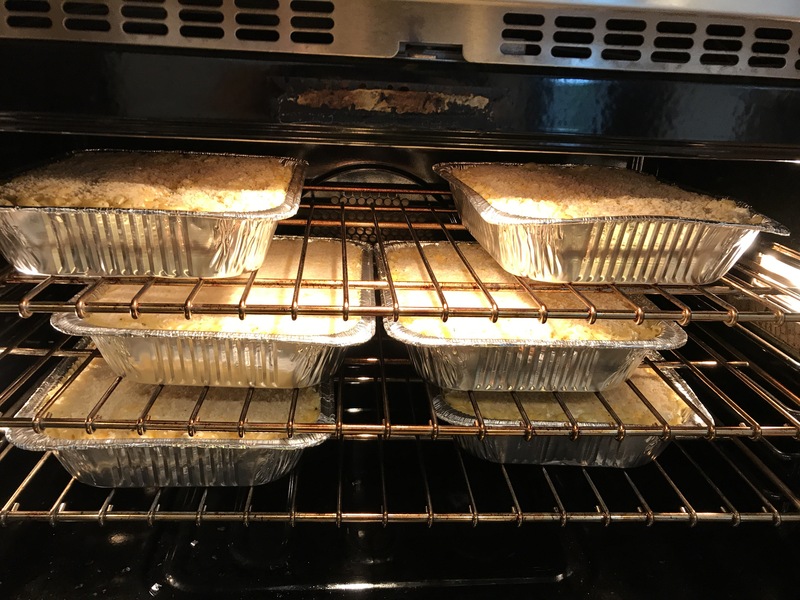 I had a little bit left, so it looks like I’ll have 13 ½-trays at the end. Only 3 batches more to go and more to come tomorrow. 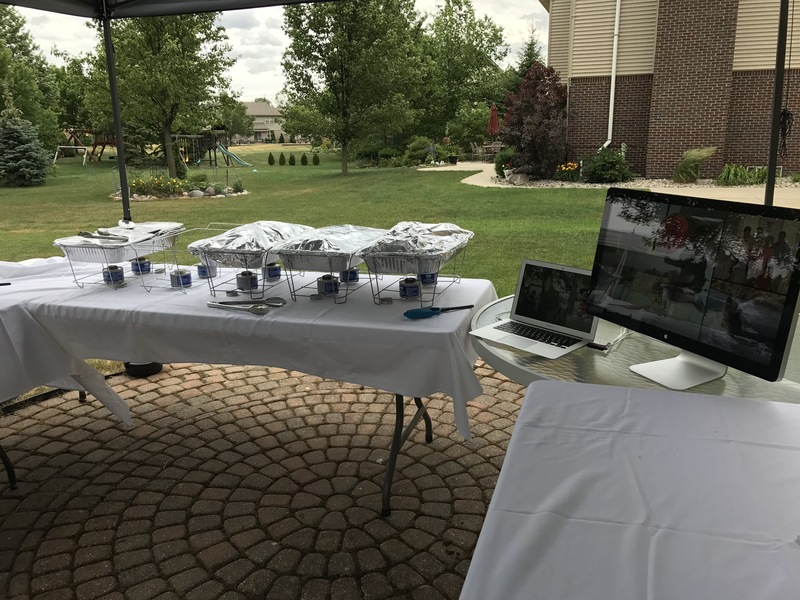 My oldest is graduating from high school this year, so we have decided to have a grad party, as many families do. I considered having it catered or at least purchasing the food already made. As I reviewed the expense, I elected to make most of the food myself. I am buying chicken, because who wants to spend the day over a fryer and because I have a local market that uses all amish chicken to make their fried chicken. The biggest savings is from making my own ribs. 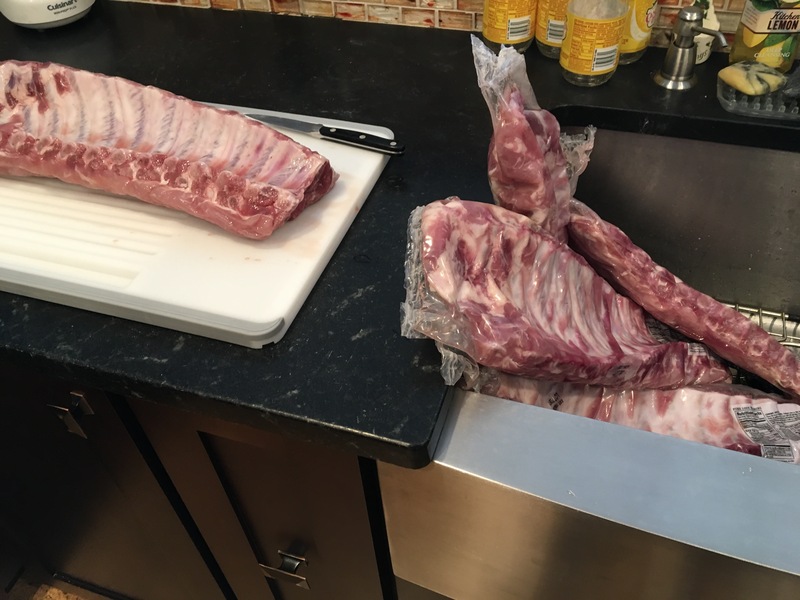 I have built up a large amount vacation days so I decided to take the week off to do the ribs. By pre-cooking them in the oven, they will only take 6 minutes on the grill on the day of the party. 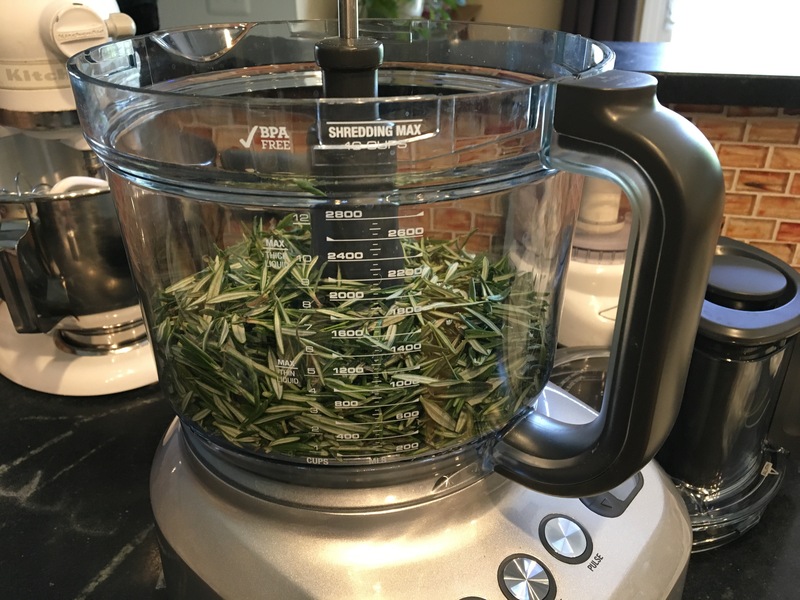 I’m starting with my rosemary in my new food processor (I decided using the broken one was going to waste too much time. The resulting sauce is thick and beautiful, my graduate decided the smell alone was amazing. 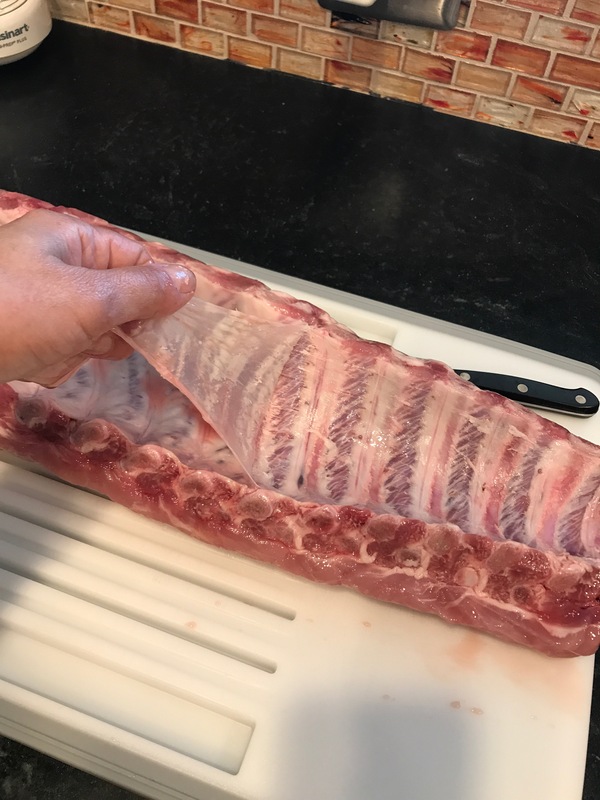 The next part is prepping the ribs for the rub; you must remove the membrane/silver skin from the back of the ribs to ensure they are tender. And then 3 to a pan; I’ll be doing about 12 of these. 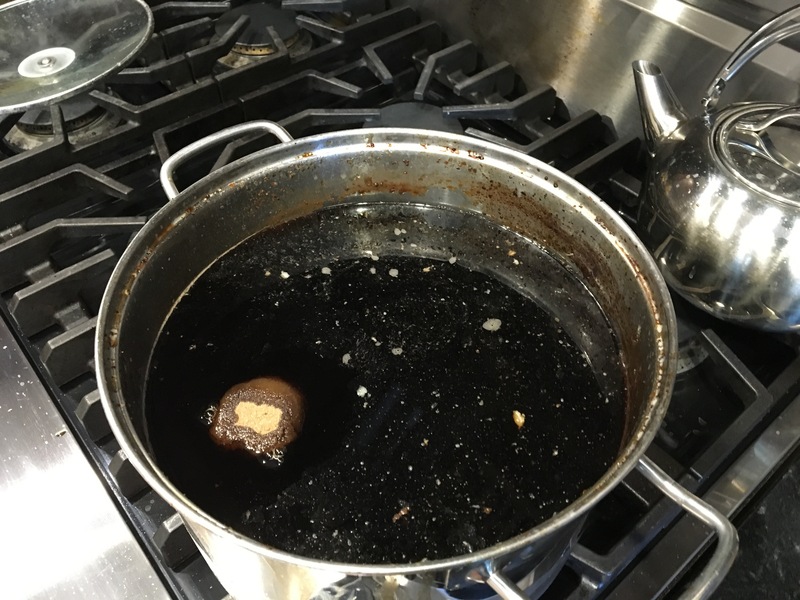 To cook them, ½ cup of water goes into each pan and they are tightly sealed with foil and roasted at 425°F for 1¾ hours. Once cooked they are very tender. 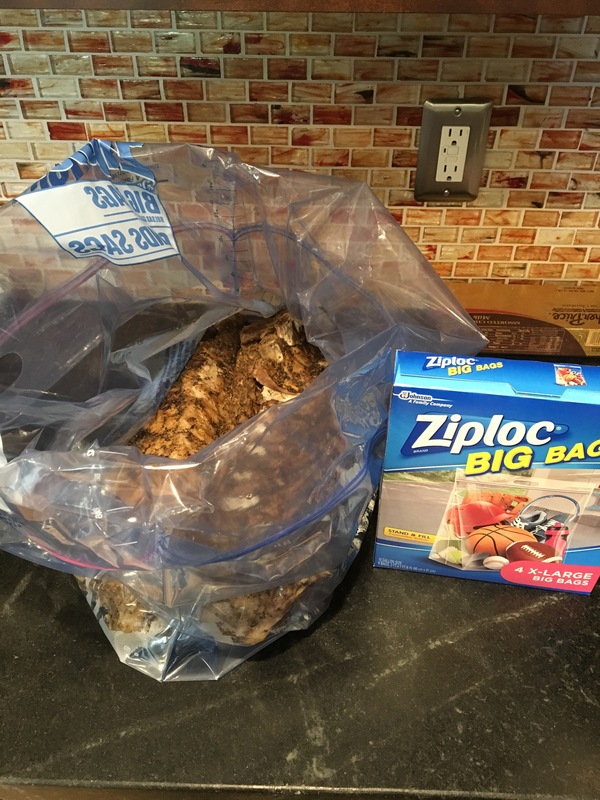 I’ll be keeping them cold in giant ziploc bags until the morning of the party. I’m reserving juice from the bottom of the pan for a glaze and I’ll have BBQ sauce too. More to come this week as I progress.